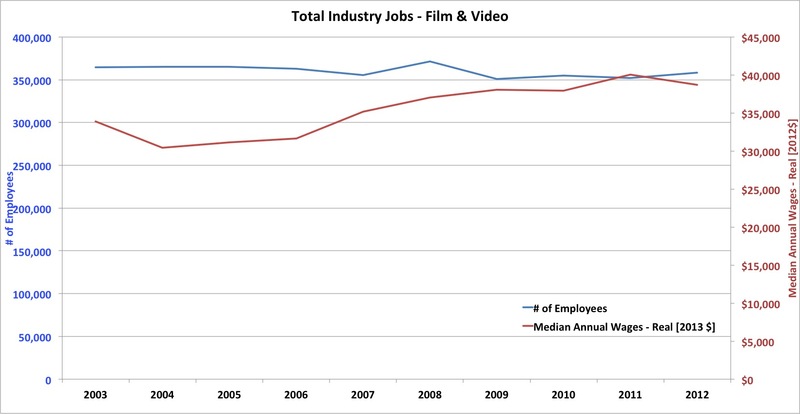 The coolest job on the official Bureau of Labor Statistics list of “Film and Video” industry occupation is definitely Motion Picture Projectionist. But since that is a fantasy job which requires mystical powers, I will focus this post on more viable options for my average readers. This has been a remarkably steady industry over the past decade in terms of number of employees (364,600 in 2003 vs. 358,190 in 2012). However, the median annual wages have risen by about 30% in real terms. Together, these two trends are different than most industries, where such increases in pay are coupled with a decrease in employment numbers, as technology makes the workplace more efficient, meaning higher wages for those who were not replaced. Many examples of such industries can be found in the popular blog written by Prof. Andy McAfee of MIT (whose research assistant I used to be). More on these larger scale trends in the next post. This post is about specific industry jobs. 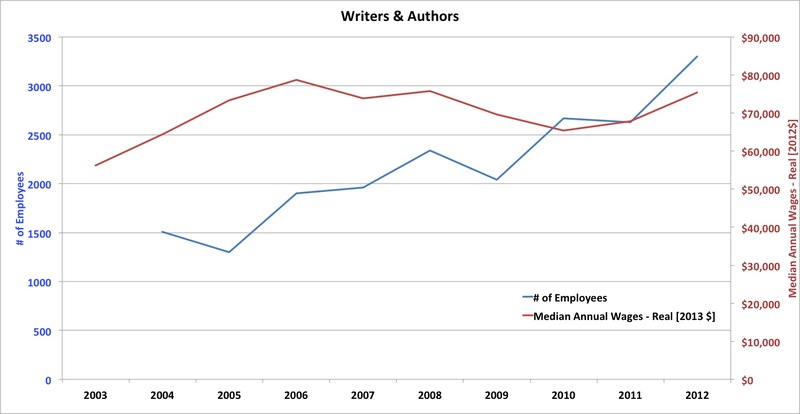 This is a more intuitive trend: 28% drop in number of employees, while wages remain steady, in real terms. This means that this segment is becoming more efficient, probably due to technology integration. 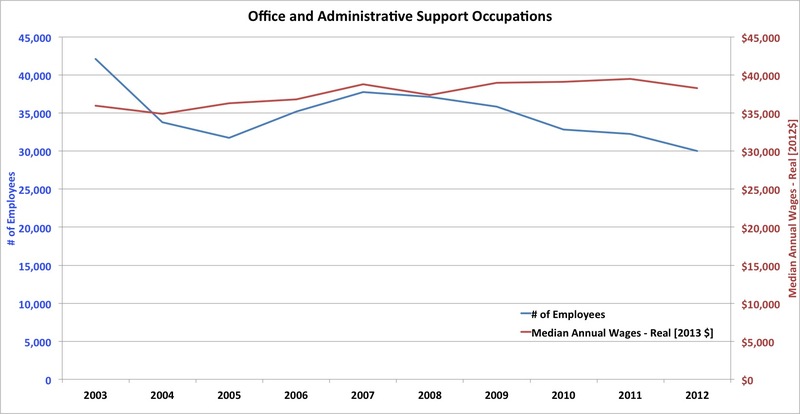 So what are the occupations that are making up for this drop in total headcount? Let’s see what’s up with more skilled occupations. Over 30% increase in number of employees, with a slight increase in pay. 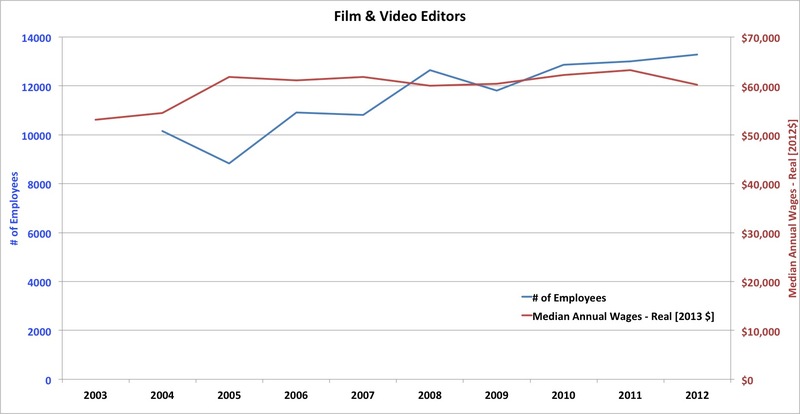 This means a good editor is in increasing demand. Hurray for editors! Here we see a 50%+ increase (!) in employment with only a very slight drop in pay. That makes sense – Hollywood needs lots of After Effects experts. Good on ya! (but take a look at my next post for a little caveat). There still are not too many of those, but their number has more than doubled(!!) with a nice increase in salaries. Human creativity is key to survival in today’s world – not only in Hollywood. This is more in line with Prof. McAfee research, and is key to your survival in the workplace. Even if you’re not a writer or officially in the “creative” department – you really must bring creative thinking to your work. Here we see a whopping 3x increase in employment, coupled with a small increase in real pay. This can have many explanations, but I believe it is key proof of the fact that Hollywood is increasingly emphasizing agile thinking over repetitive blind labor. 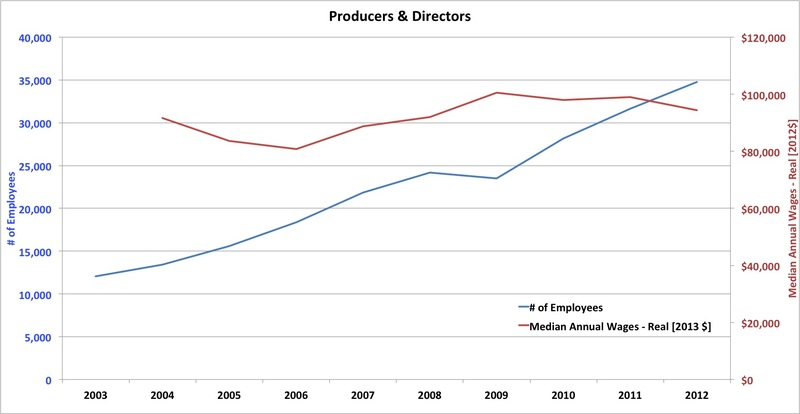 There is an increasing need for “producer/director-types” – adaptable, creative leaders. The conclusion is that Hollywood is becoming more intelligent. It is seeking creative, adaptable, quick, original thinkers, rather than repetitive key punchers. 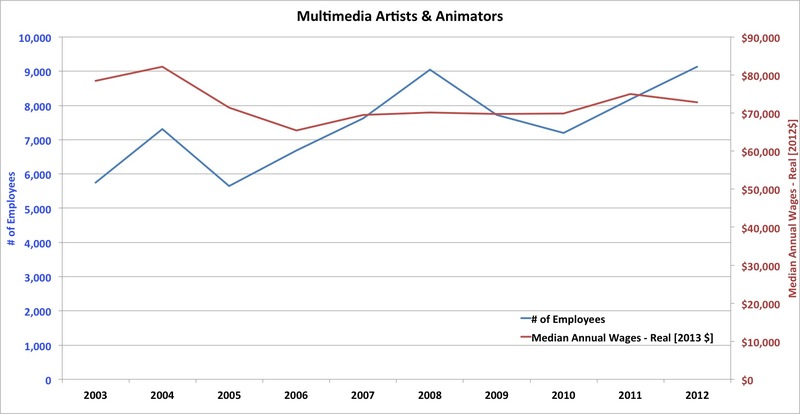 Menial tasks can be done by a computer or by the studio’s president’s son, because there is no better way to filter potential talent for those jobs. Don’t compete against them. Show you have irreplaceable added value. This is the new reality, and it is a good reality – an intelligent, meritocratic, human reality.